Pass The Fruit & Vegetables, Please. Using vegetables and fruit with (or without) various flowers to adorn the center of a dining table has been around since Julius Caesar first asked, “Who hid the grapes?” It only seems like a new idea when it shows up on the cover of a magazine or when it is done in such a dramatic, interesting way that you have to stand up and take notice. ZFor best results, use them in conjunction with your particular theme or food choices. Rustic Italian – Entice your guests with an abundance of ripe fruits or vegetables to symbolize fertility. Shown on a crisp white linen tablecloth to make the colors pop! Earthy – Group colorful fruits and vegetables with candles, clay pots and wrought iron candlesticks to please mother nature. Summer Splash – Adding brightly colored citrus fruit to a simple centerpiece will add a touch of whimsy and color! Remember when your mother told you not to play with your food? This is a good reminder to not get too carried away! Plus, food belongs on or near the table. 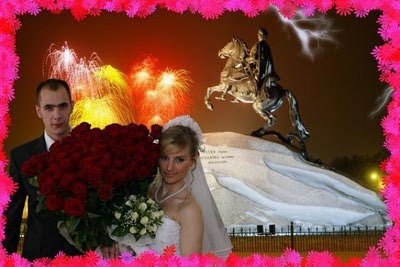 Although a picture may be worth a thousand words, these example of bad wedding photography left me speechless. 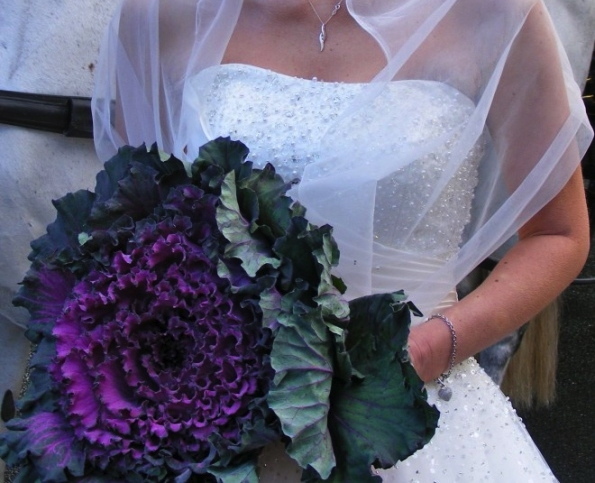 I am not talking about photos of the worst weddings or gowns or bad examples of themes…. I am talking about the actual photography. The pictures where a trained, professional photographer should never dare to go. 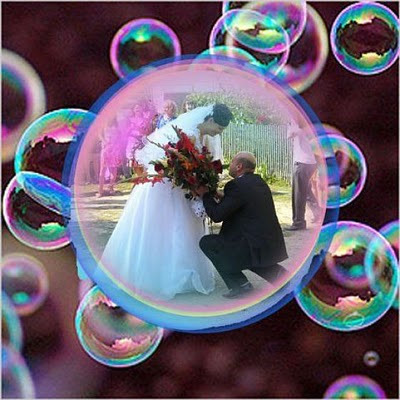 Why is the bride superimposed in the center of a rose? It may sound quaint and possibly romantic when described but, the end result is tacky and forced. One more time, pay attention to what is going on in the background. 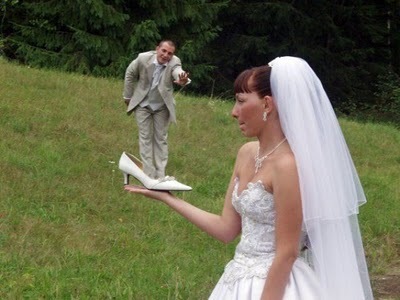 I’m not sure I understand the significance of the tiny groom in the shoe.Maybe someone was trying to be clever. Trying to be clever and unique is a bad idea unless you are a skilled professional. 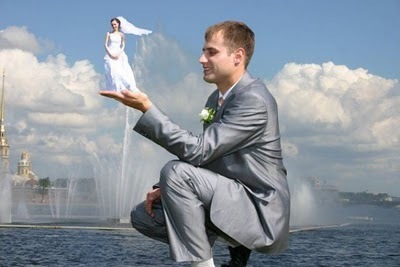 How about a tiny little bride sitting in the groom’s hand. Even worse, there is water squirting up into her nether regions….. I don’t get it. This man has the choice of two brides, a tiny bride and a regular sized one. Why are there two brides? Adding ethereal backgrounds is lazy… and weird. and why are there a bunch of roses in between the bride and groom? 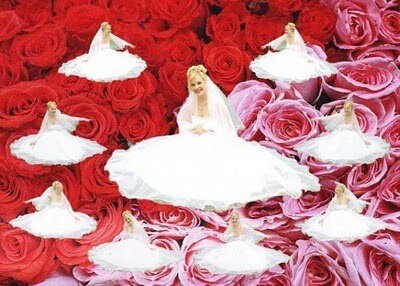 A bride, superimposed on a bunch of roses, looking at herself in various poses. Is this narcissism at it’s worst (look at me) or perhaps a bad photographer who talked this woman into a photo she didn’t quite understand. I’m with her, I have no idea what this is about. Okay, just one more…. seriously? When you book your wedding photographer, make sure you have a clear understanding of what to expect and their specialty. Talk to their past clients, look through their photo albums, and if any of these photos show up, run as fast as you can! Looking for a great way to add interest to your wedding photos? Frame it! This is as simple as having one or more large frames on hand. Not only can you use it for photos of the two of you, the frames can also be passed around at the reception to get fun, almost candid pictures of your loved ones! Try using several different shapes for more interesting photos. Even before the wedding day, using frames in your engagement photos can bring a hint of whimsy and let guests know what they might expect at your event. The best part? This is something everyone can get their hands on, no matter what their budget. Flea markets, garage sales and consignment shops often have giant frames for a few dollars. All you need is some patience and a can of spray paint! Gone are the days when the bride and groom’s only choice was to pose for a carefully crafted ‘Offical Wedding Photo’. Photographers have evolved into master storytellers through candid shots, off-site photos and staged portraits. Below are just some of the options to consider when booking your wedding photographer. Photojournalism is a style of photography that captures the events of the day ina truly candid style. Very few, if any, of the shots are posed. This is by far the most popular style of photography according to market trends. There are some drawbacks involved – especially if your photographer is inexperienced in this field. 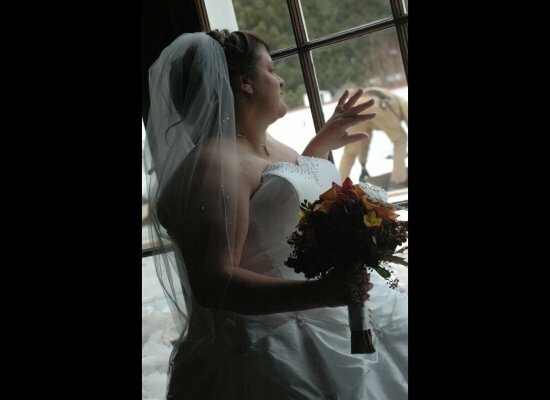 Make sure the photographer has ample references and photos for you to check before you even consider wedding Photojournalism. In addition, without some of the posed shots you may wind up with a wedding album where quite a few people are missing. The most important thing to do when booking your wedding photographer is to make sure the photographer you hire is the one who will be at your event. Do not accept a substitute unless you have seen examples of his/her work. Always remember to get everything in writing!